Including almost everything you will ever need in order to run an efficient and effective contact centre operation, Noetica’s product range combines our core Synthesys™ productivity suite with tried and tested yet pioneering outbound predictive dialling technology under the SmartBound™ brand. All this is underpinned by our solid call centre telephony voice platform (NVP™). At its core, Synthesys™ is a generic contact centre agent desktop orchestration and workflow engine, providing visual rapidly deployed means of generating highly streamlined applications for customer contact. 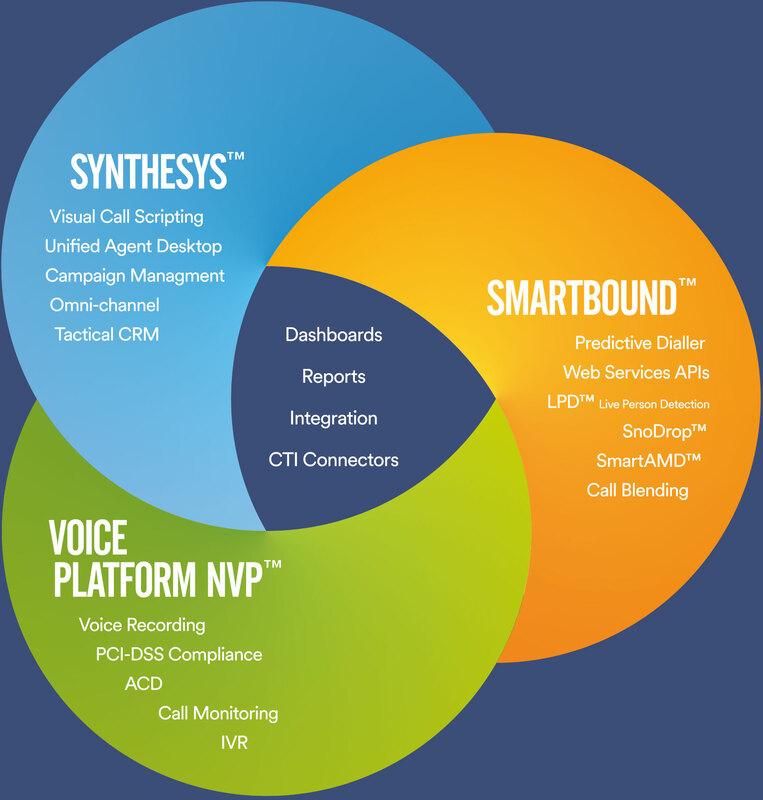 Built around the solid foundations of logically rigorous yet easy to use visual call scripting and flexible, CRM components, Synthesys™ manages to consistently deliver agent interfaces that are integrated, ergonomic yet powerful and efficient. All this combines seamlessly with Noetica’s next generation outbound technology which aims to deliver responsible and safe proactive contact technology without compromising on power and efficiency. Noetica owns international patents that form part of our latest SmartBound™ initiative to protect our customers from falling foul of ever stricter regulation whilst maintaining the same high level of throughput. Supporting all this is the Noetica Voice Platform (NVP™), a state of the art telephony system complete with ACD, IVR, call recording and anything else that one expects from a modern call centre telephony platform. Because NVP™ is not built around a traditional enterprise PBX, it is highly cost effective and can be deployed on premise or in the cloud.